South Indian, specifically Tambrahm version of the ubiquitous stuffed eggplant. 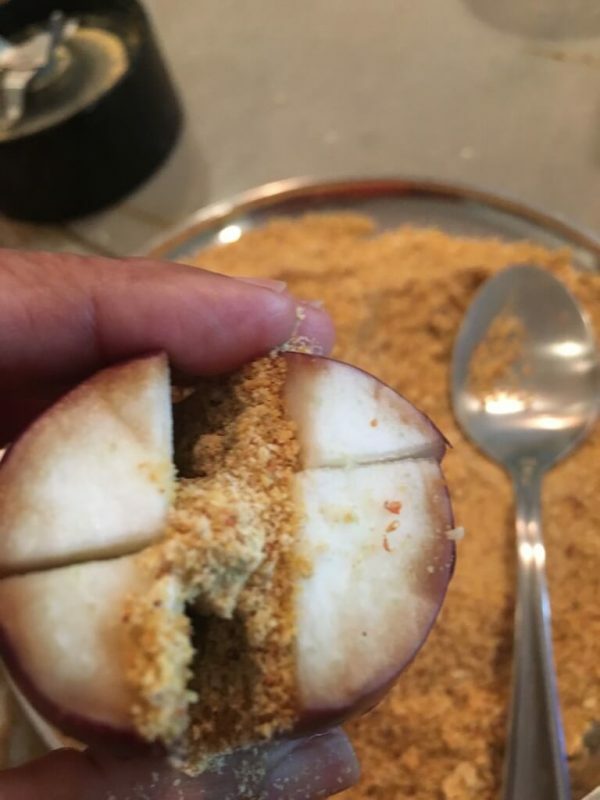 Every region in India has its own version, and they're all delicious. This is mine! 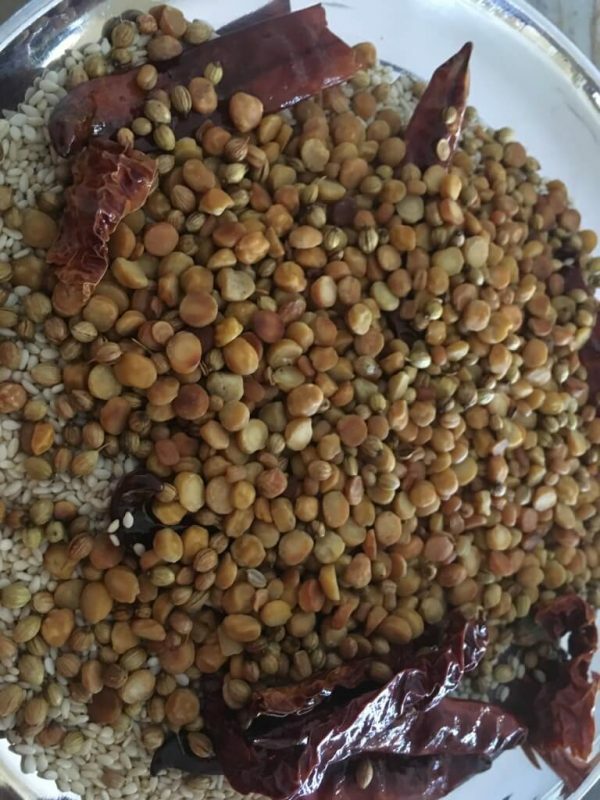 It goes excellent with rice/sambar, rice/rasam, and rotis. 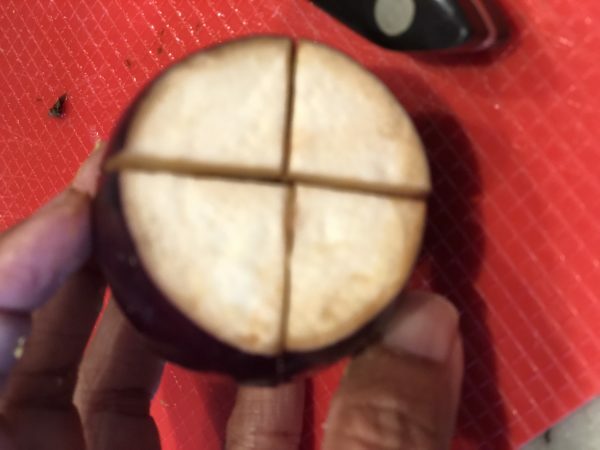 Take each eggplant, cut the stem off, and make a slit like a plus sign, not cutting through completely. Which will leave the eggplant intact, with a slit. Keep them in a bowl of water to prevent discoloring. 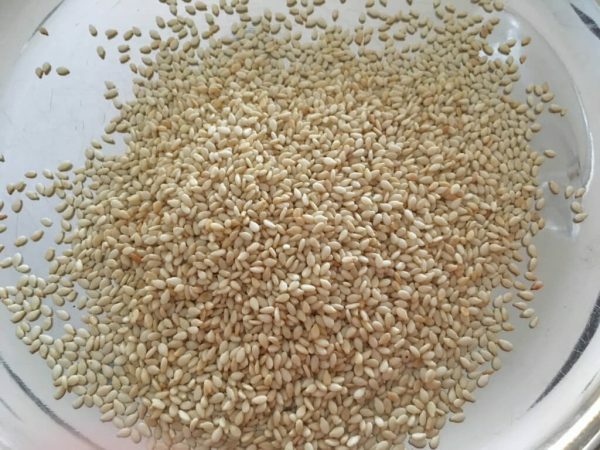 You will also lose some seeds in the water, and lessen the bitterness from the seeds. Try doing this without breaking the eggplant. If it breaks, don't worry. It's all good! 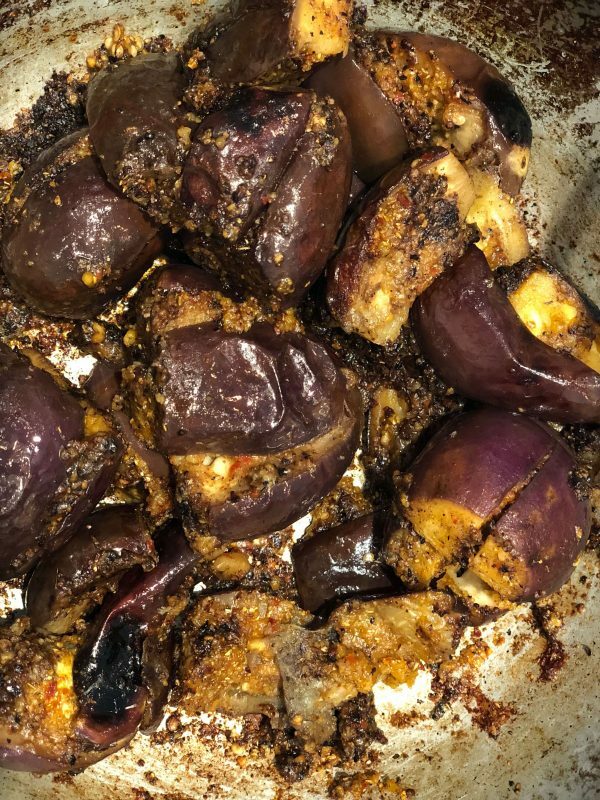 Finish stuffing all the eggplants this way and heat the 3 tbsp of oil in the same kadai. A thick bottomed kadai is preferable to cook these babies. When the oil is hot, add the mustard seeds; let them pop. Add the hing and let it fry. 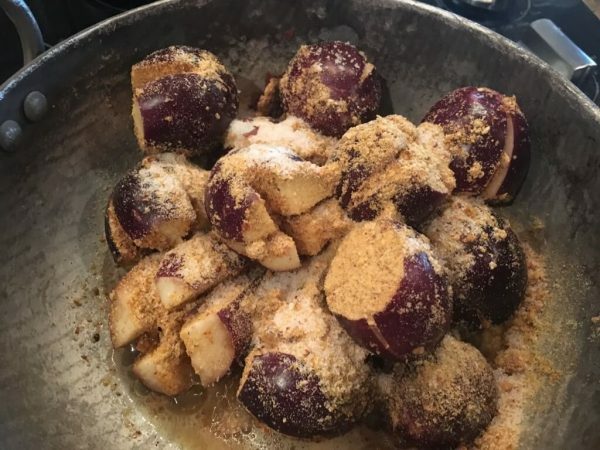 Now add the eggplants, add some more masala for good measure, salt and give it a good mix. When all the eggplants are uniformly cooked, add some fresh curry leaves, and cilantro. Turn the heat off! 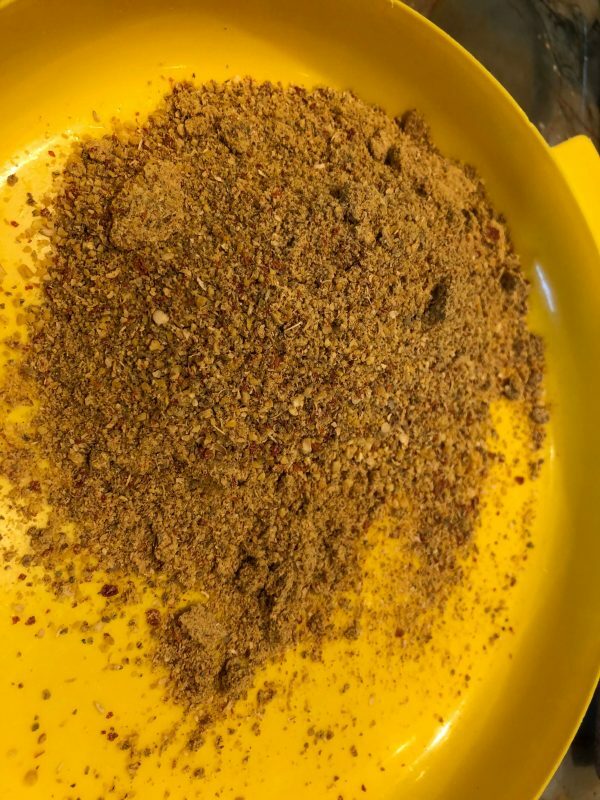 The dry spice mix is the one that I am used to and comfortable with. 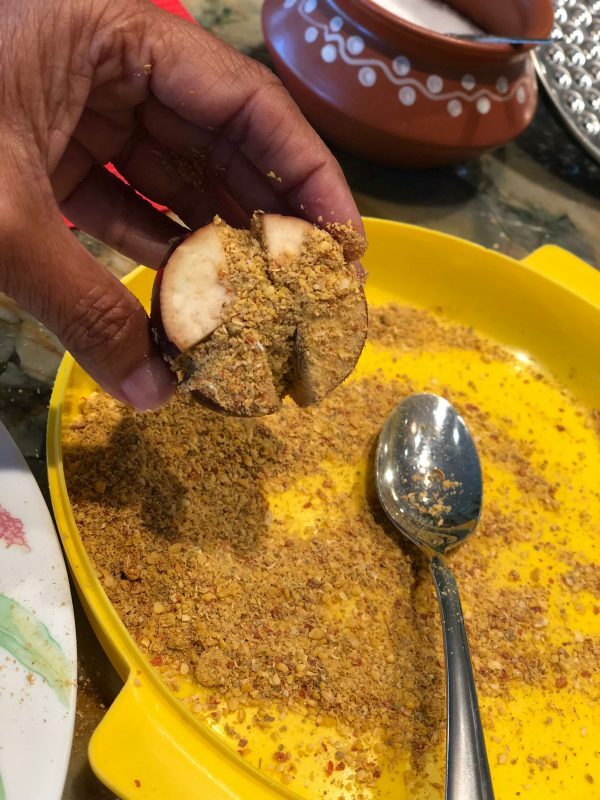 I always make more masala (in my family, it's called curry podi) than I need and store it for a couple of weeks. 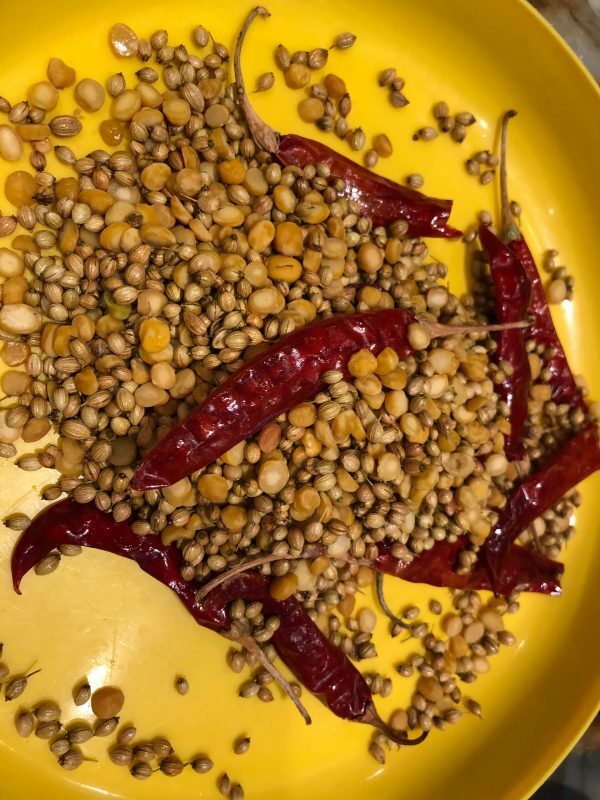 This masala is very versatile and can be used as a finishing touch for any vegetable, and does not need cooking too much as the spices are roasted already. 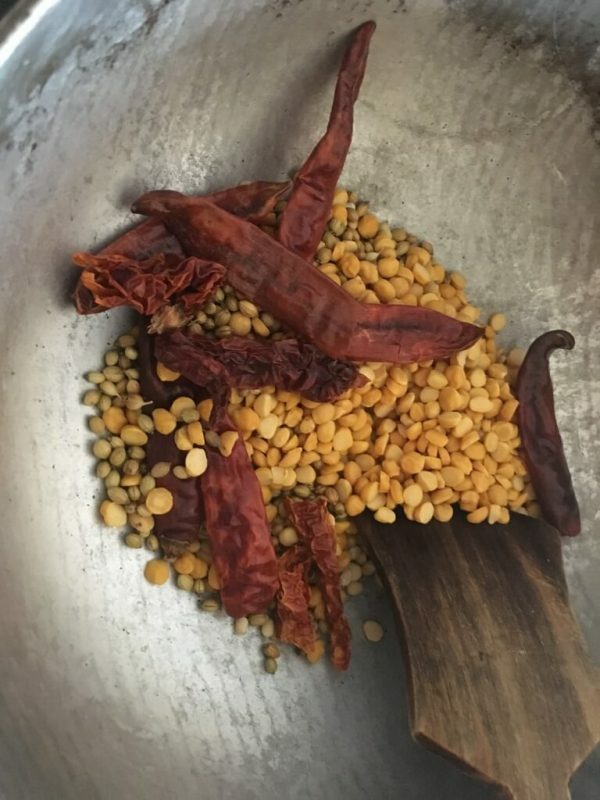 I have been wanting to try a different masala which is a paste, and includes coconut, peanuts, and tamarind.That recipe is for another day! This eggplant dish pairs well with rice (sambar, rasam, kadhi, yogurt) as well as pooris, parathas, and rotis! 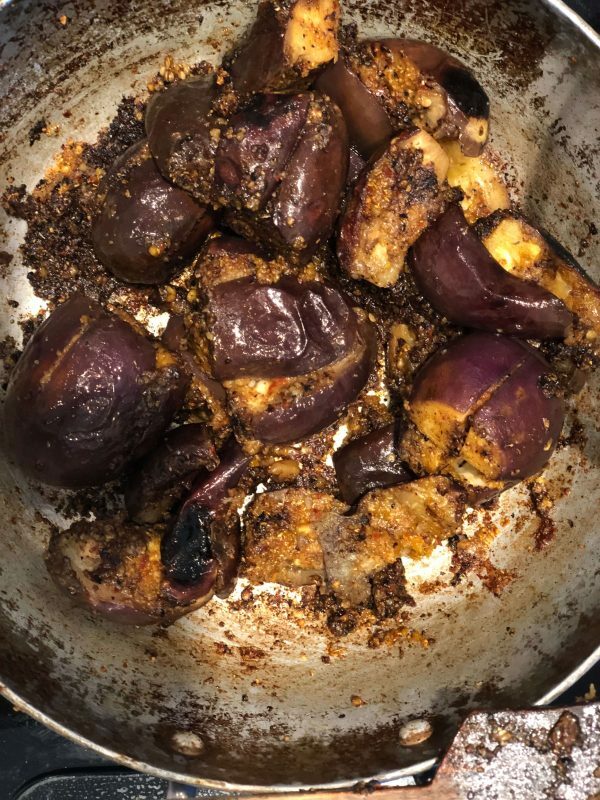 I have not used too much oil in this, contrary to the name "ennai kathirikkai" which translates to oil eggplant 🙂 , but once in a while it would be fun to splurge on it! 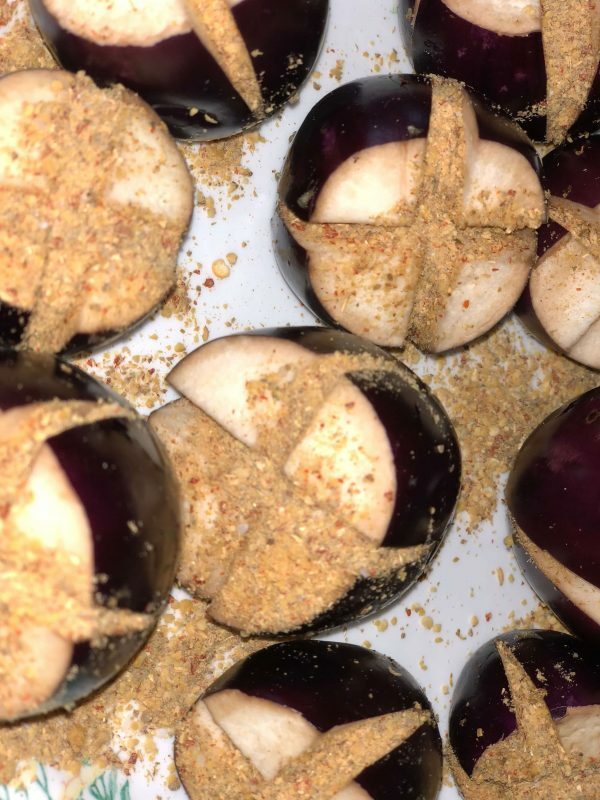 Baby eggplants work best for stuffing. 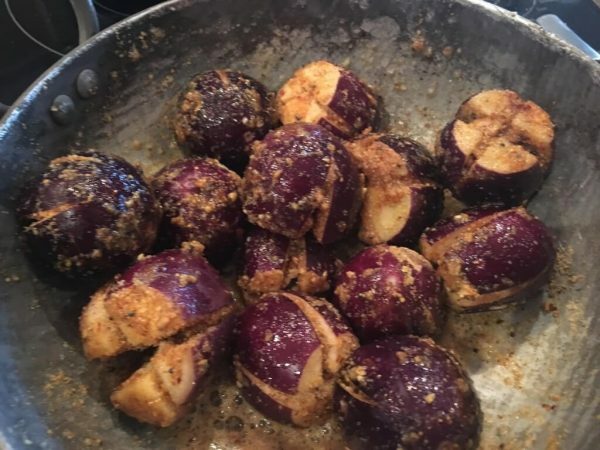 If you don't have them, regular eggplants work just as well, except they won't be stuffed. Chop them into 3 inch long pieces, add them to the oil first, semi-cook them, and then the masala and stir fry-cook them. Eggplants mature really quickly. Try to get them as fresh as possible. The most tender, best tasting tender eggplants have the brightest green stems. 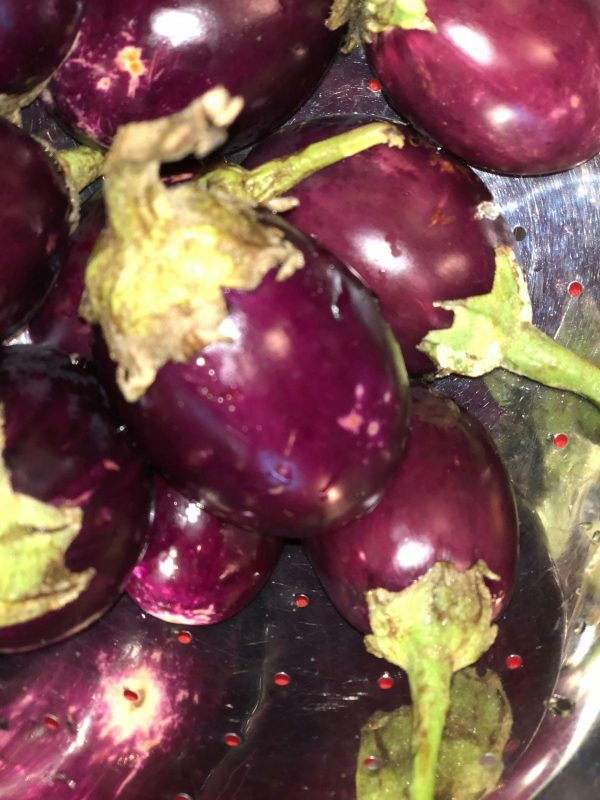 If the stem is brown, the eggplant is not tender and probably has plenty of bitter seeds. Once you buy them, they continue to mature quickly in your refrigerator, so use them up as soon as possible. 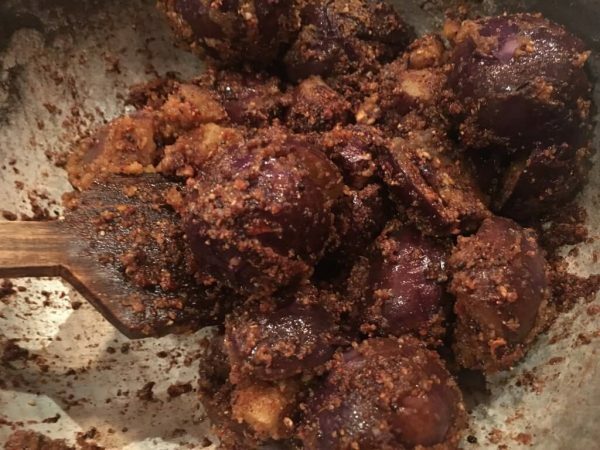 Eggplant is one of those vegetables that needs salt in the initial stages of cooking or it won't take it. 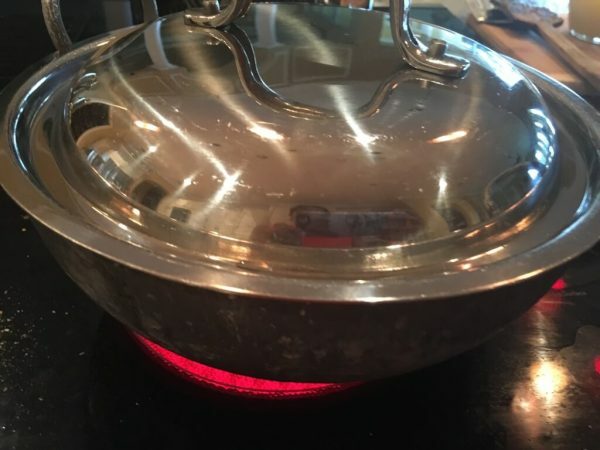 Try not to forget to add salt as soon as you dump them in the kadai for cooking.